Lance Roux, owner of SafetyPro Resources, was frustrated. His website, which he had spent thousands of dollars on, was beautiful, but had little to no traffic. He had always gotten most of his clients through referrals, but now he was trying to grow beyond that. He spent money on industry trade shows, print advertising, and sponsorships, but was not seeing much of a return on his investment. Congratulations! The wait is over; you have found the top secrets for all inbound markers to know for quick success! As inbound marketers, we struggle to find time for anything aside from our job, so there should be shortcuts to the path of success. We have made an infographic for you to visualize just how easy it really can be. 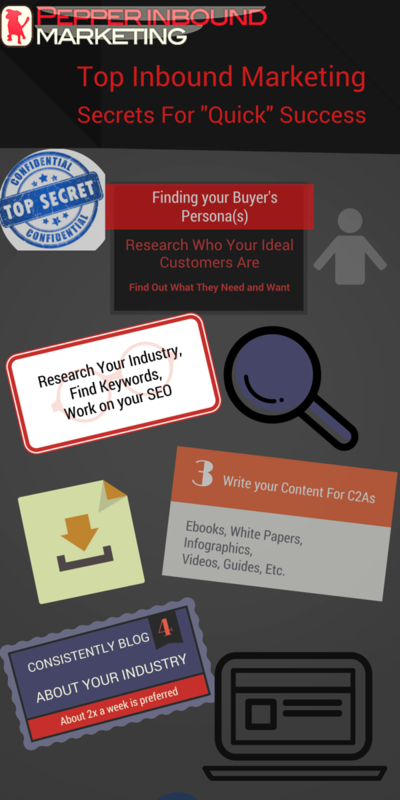 Without further ado, here are the top secrets of inbound marketing!